If you want to game THAT 1812, this might be of interest even though it is 1813. Thread: If you want to game THAT 1812, this might be of interest even though it is 1813. Big chance for sweetwater captains. It's probably coming sooner, but I just didn't want to put too much pressure on myself. All I need is to run through a game to make sure the module works properly, then edit/rewrite the rules. So I'm going to need playtesters soon (in about a month?) Anyone who's interested should contact me. The only requirement is that you must promise to post one playtest AAR on my Boardgamegeek game page. For SGN and miniatures, there's also going to be a Maneuver Layer that stages the battles from first sighting to tabletop range. I'll be working on that while the campaign game is being playtested. You could stage miniatures battles just from the encounters on the campaign level -- the game would give you the general situation and your order of battle, but you'd need to use a lot of imagination/other mechanisms to decide on ship headings and starting positions relative to each other, wind, weather, etc. I think I'll post my shakedown game using the Vassal module as an extended playthrough AAR on my designer diary blog. That will also help fans understand how to play. Once this design work is done, I will go back to making more Great Lakes ship models for my Swash & Buckle site on Shapeways. Coming will be schooners, a fast pilot boat, and the formidable USS General Pike. 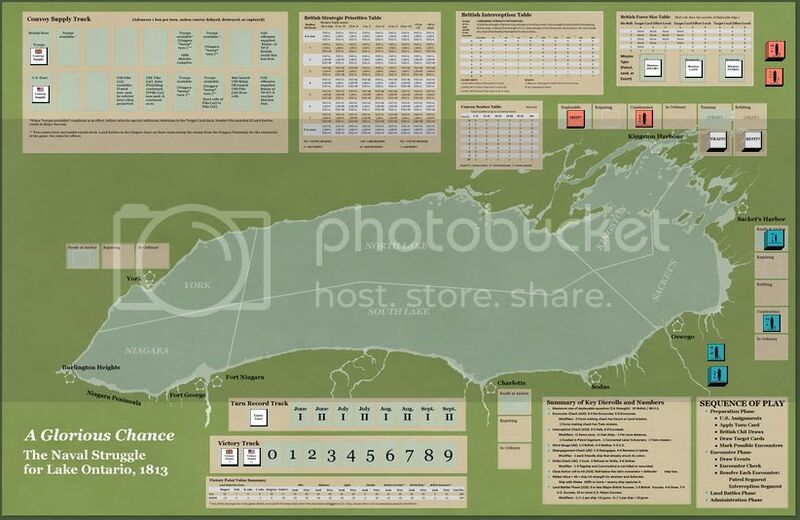 Eventually all types necessary for the complete US and British squadrons of 1813 on Lake Ontario will be available. And, of course, those same models can stand in for Lake Erie ships too (The USS Niagara/Lawrence is already there, and a number of you seem to be enjoying it). Please feel free to ask any questions or share any comments about A Glorious Chance -- either here on on the BGG game page. "A Glorious Chance" rules posted! The Vassal module will go out to playtesters within the next 24-48 hours. Have a read-through and see if this game is your cup of tea. Anyone interested in playtesting, please let me know!